Epistaxis refers to bleeding from the nose. In the vast majority of cases, it is relatively insignificant. However, in a small proportion of patients, it can present with significant haemorrhage that can lead to hypovolemia and shock, and warrants urgent intervention. Anterior bleeds (90%) – originate from ruptured blood vessels in Little’s area, a highly vascularised region formed by the anastomosis of 5 arteries. Posterior bleeds (10%) – develop from the deeper structures of the nose, occur more in older individuals, and have a greater risk of compromising the airway. In this article, we shall look at the causes, investigations and management of epistaxis. Little’s area (also known as Kiesselbach’s plexus) is found on the anterior nasal septum and is an anastomosis of 5 arteries: anterior ethmoidal artery, posterior ethmoidal artery, sphenopalatine artery, greater palatine artery, and the septal branch of the superior labial artery. The large majority of epistaxis cases are due to trauma (“picking”) or a foreign body. An initial history should include details of any recent trauma, co-morbidities or familial conditions (especially clotting abnormalities), relevant drug history, previous episodes, and any facial pain*, otalgia, systemic symptoms, or clinical features of clotting disorders. The initial management of epistaxis is dependent on the size of the bleed. All patients should be kept sat up and sat forward to protect the airway. Large bleeds should be approached in an A to E manner. This may include fluid resuscitation, with blood products given if necessary. All patients (unless significant blood loss has occurred and urgent intervention is required), should be trialled with a nose peg applied for 20 minutes. Ice should be applied to either the back of the neck or the bridge of the nose to stimulate further vasoconstriction. The definitive management of ongoing epistaxis occurs in a stepwise manner and is dependent on the degree of epistaxis. Consider obtaining routine bloods, including full blood count, urea and electrolytes, clotting and a group and save. Once the patient is stable and the bleeding is controlled, a further specialised assessment of the bleed can occur. 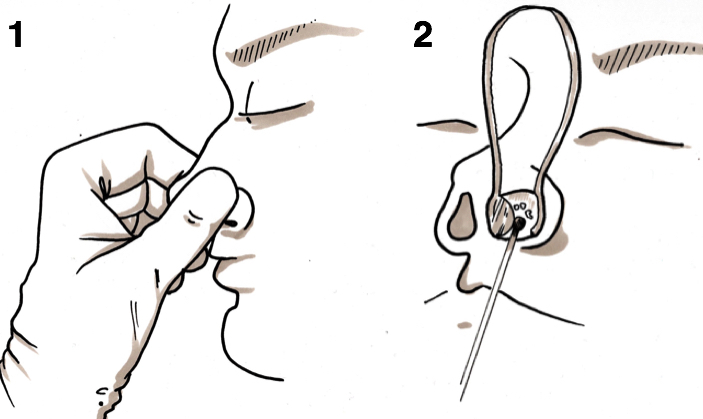 A thudichum can be used to inspect the septum. If there is too much blood present to visualise the septum, adrenaline-soaked gauze can be inserted into the nasal cavity to cause localised vasoconstriction and soak-up any excess blood. If no bleeding point can be identified, it is important to examine the oropharynx (more indicative of a posterior bleed). If an anterior bleed point is identified, then the vessel can be cauterised using silver nitrate via anterior rhinoscopy (Fig. 1). Anterior packing should be trialled (Fig. 2), whereby the nasal cavity is packed using a merocel nasal tampon. If this fails to control the bleeding, then a contralateral merocel nasal tampon can be inserted. 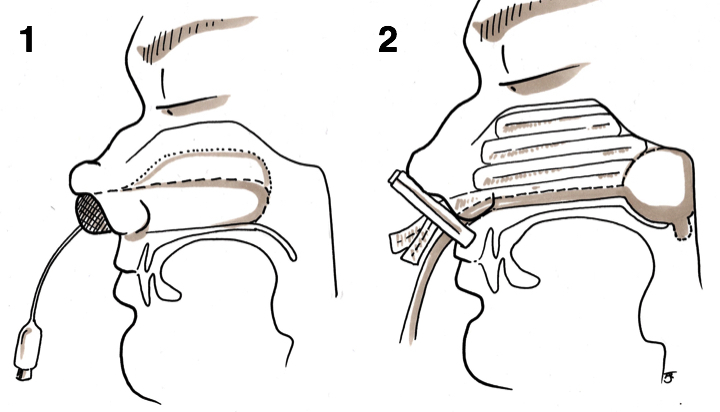 If the epistaxis persists and bleeding is entering the oropharynx, posterior packing with a Foley catheter (Fig. 2) and bismuth iodoform paraffin paste gauze (BIPP) is warranted. As before, if this fails to control the bleeding, then a contralateral pack should be inserted. If nasal packing fails to stop the bleeding, then contributing blood vessels can either be ligated surgically or embolised radiologically. The vessels that are targeted are usually the sphenopalatine artery, anterior ethmoidal artery (not for embolisation due to origin from the ICA), or the external carotid artery (as a last resort). Which of the following arteries does not supply Little's area? A 60yr old patient with no PMH presents with unprovoked epistaxis with associated facial pain and otalgia. Which of the following is the most likely diagnosis? What agent is most commonly used in cauterising for epistaxis?